Happy Friday, everyone! I’m made you something with fun sprinkles to help you celebrate the end of your week. I hope you have some awesome plans for this weekend. I think I have not 1, but 2 fun things in the works that I am looking forward to sharing with you on my next Travel Tuesday-Staycation post. So I’ve been trying to make some cleaner, healthier-sorta-kinda, desserts that I can keep around the house that I don’t have to worry about sharing. This way, when I’m being taunted by store bought chocolate chip cookies, I have a better option. Combine natural peanut butter and the maple syrup in a medium bowl and stir vigorously for about a minute until the mixture has thickened. Add the coconut and stir until well combined. 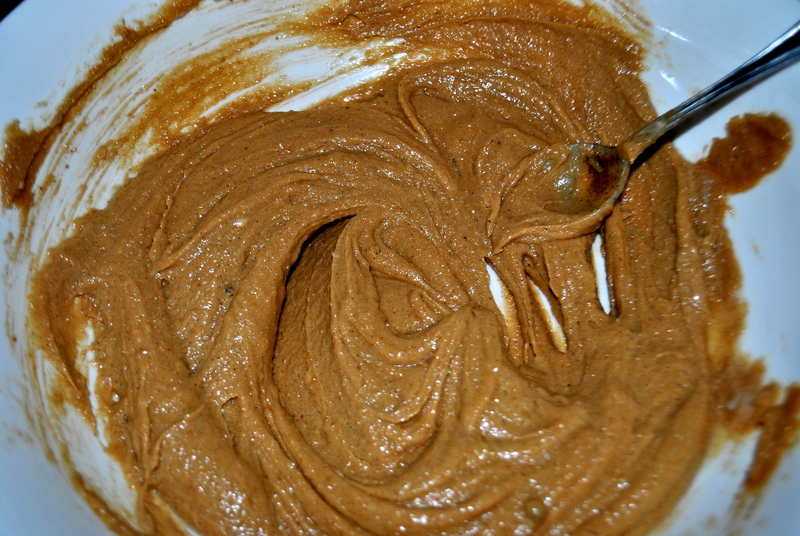 The amount of the coconut flour will depend on the consistency of your peanut butter. Start with 2 TBSP, combine and let sit for a minute or two. 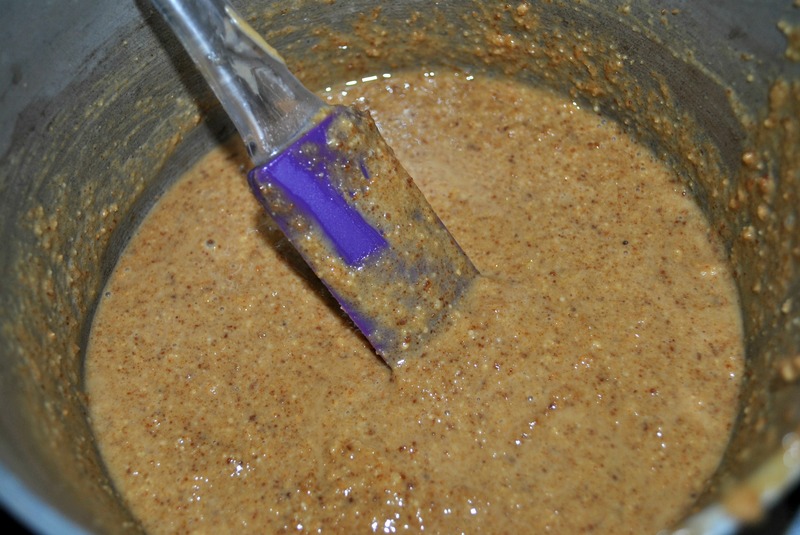 The coconut flour will continue to absorbed the moisture in the mixture and will continue to thicken. 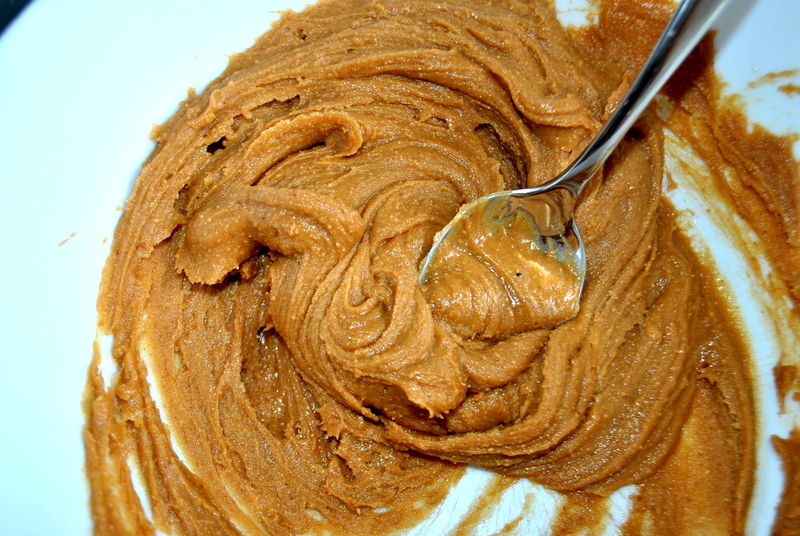 Add a bit more if the peanut butter remains sticky. 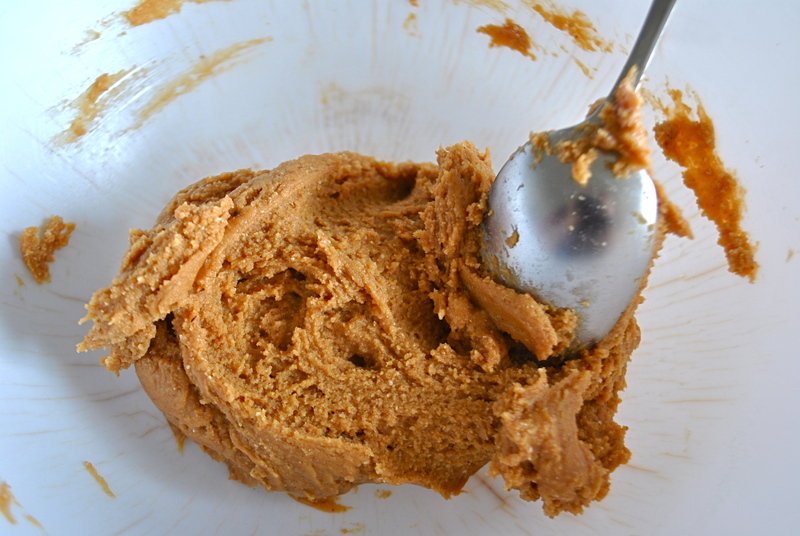 You want to be able to roll the peanut butter into a ball without it sticking to your hands (add more flour if this is the case) and without cracking or crumbling (add more maple syrup). See my picture below for a reference on what your dough should look like. Add cereal and gently combine. 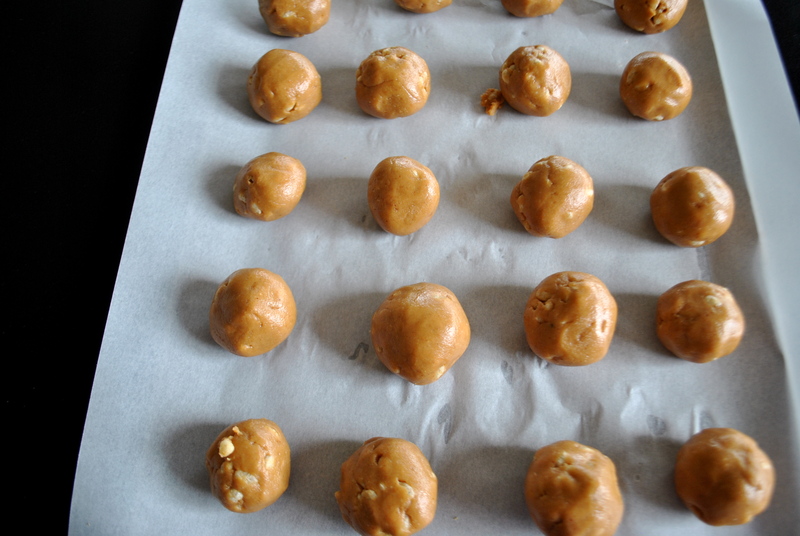 Shape into balls and place on a baking sheet lined with parchment paper (I was able to make 20 but I would suggest going smaller for a better Peanut butter/ chocolate ratio). Place in freezer while you prepare the chocolate. 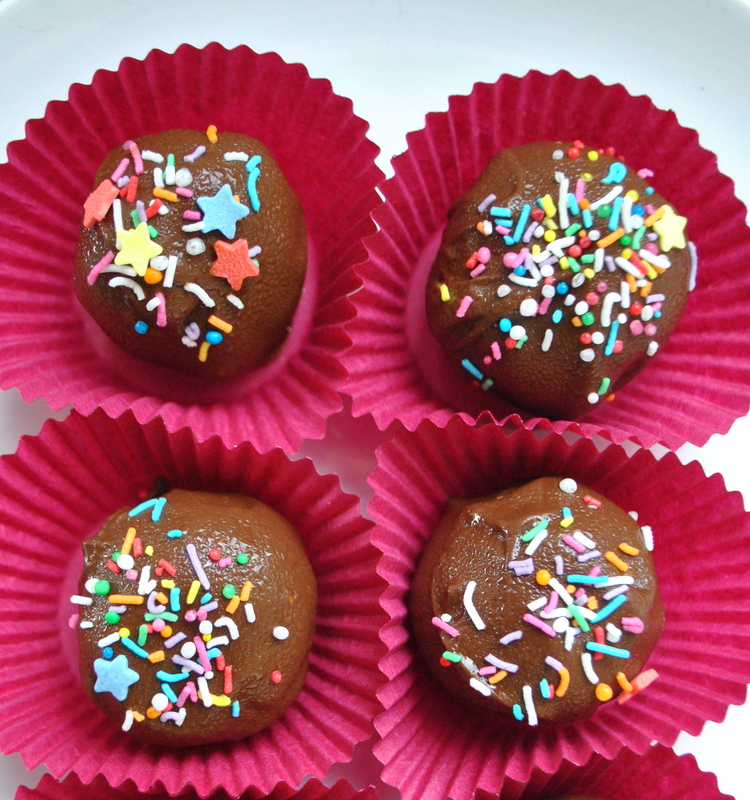 On medium heat,melt the chocolate and coconut oil in a double boiler. Once the chocolate had begun to melt, stir the chocolate around until it becomes smooth then remove from heat. 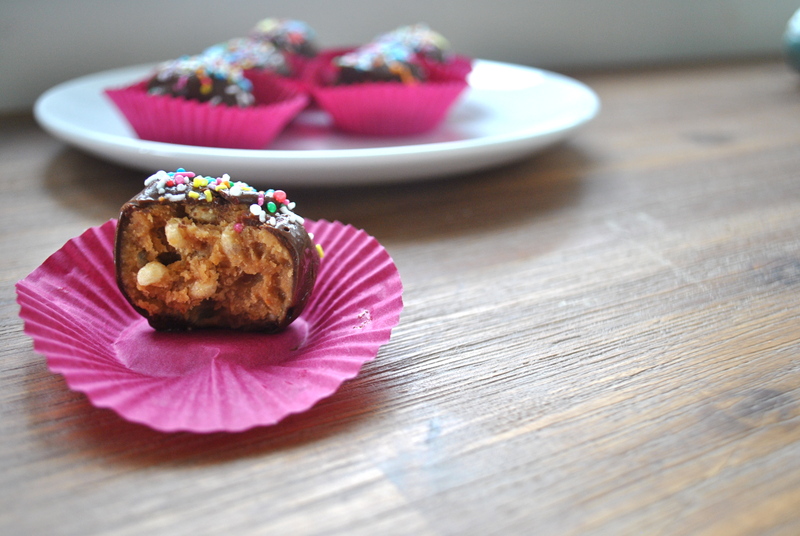 Remove the peanut butter balls from the freezer. One at a time, drop them into the melted chocolate, roll around until it is covered, then roll it gently up the side to help remove excess chocolate. Place in the fridge or freezer for another 10 minutes or so for the chocolate to harden. Keep chilled. I had been eyeing this recipe since I received two large jars of Teddy’s peanut butter from home for Christmas. I sort of forgot about it with the craziness of the holidays but the other day, I realized I was down to my last 1/2 of a jar and knew I had to make this before it was too late. The filling is straight up peanut butter goodness! The rice cereal adds a nice texture but the best part is, because it’s so peanut buttery, I’m good with one. It’s the perfect little afternoon snack! AND peanut butter is a very American thing and most of the family doesn’t particularly like them so they are all for me! Yesssss! PS. did you notice in the first picture the condensation on the Peanut Butter Balls because it was SO hot here when I was photographing them? It reminded me of this skit. LOL! Happy Friday. 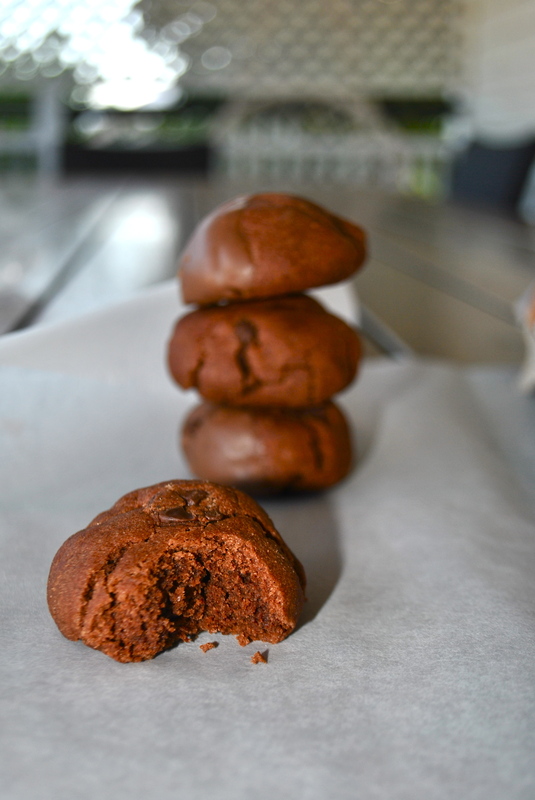 So today I’m sharing with you Peanut Butter Triple Chocolate Cookies, aka, The Resolution Breakers. These can be eaten in cookie format OR in cookie dough format. They have three kinds of chocolate, they have peanut, they have sugar, they are basically everything that people give up when they start the New Year and swear to eat health. I’m sorry but they are just too good not to share. Sally Hansen- Golden Rule nail polish. It’s gold and glittery and nothing like the normal nail polishes I wear, which are black or red. But I’m half way through my Golden Rule bottle and I still love it so that speaks volumes. I tried to take one of those fancy pinterest photos of my nails and the nail bottle and honestly, it just wasn’t happening. Google it. You’ll find pictures a thousand times better then mine. 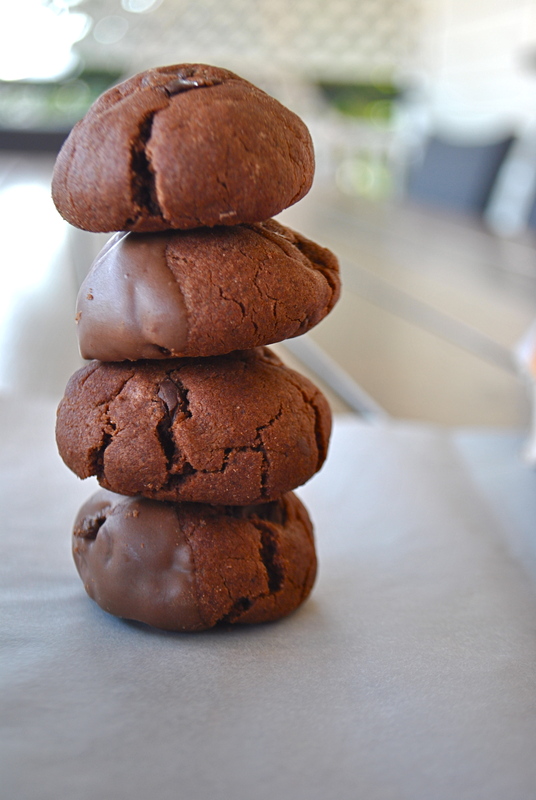 and finally, these Peanut Butter Triple Chocolate cookies. I’ve been craving chocolate like there’s no tomorrow lately and these seem to hit the spot. I threw in some peanut butter on a whim. My all time favorite peanut butter is Teddy’s and I received two jars from the states for Christmas. I’ve pretty much been eating it on everything which may or may not be a good thing. 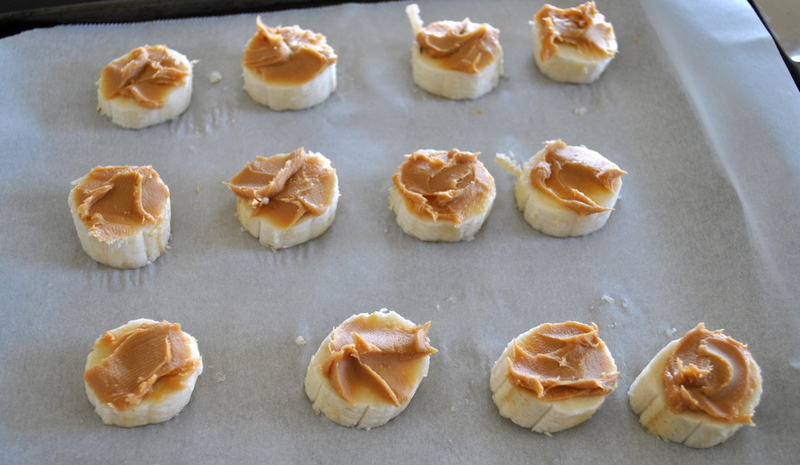 So, when I was making these cookies I thought, why not throw some peanut butter in? And then I thought, why not dunk the thing in even more chocolate. Yeah…I think I have a problem. 2. Roll into balls and place on greased baking trays. Bake in oven at 320°F/160°C for 10-15 minutes or until cooked. Cool on a wire rack. 3. 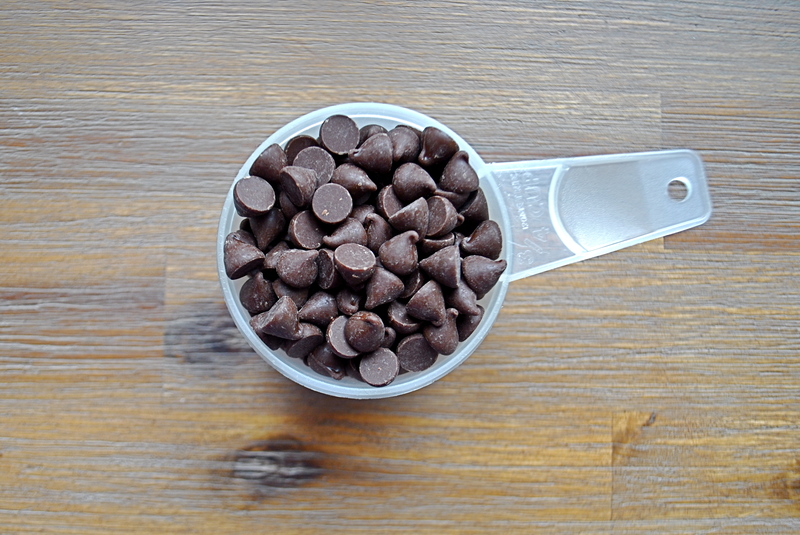 Once cool, melt your chocolate chips in a double boiler (my preferred method) or in the microwave. 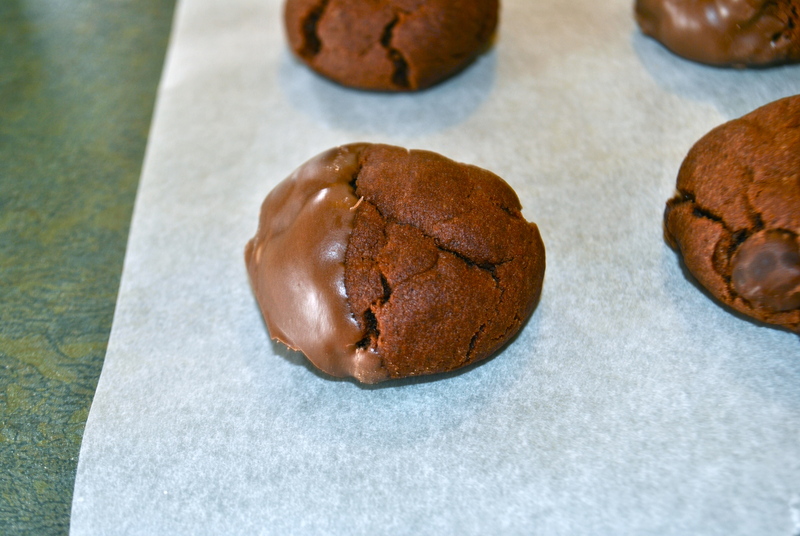 Dunk half the cookie in the chocolate and place on wax paper to dry. These also make DELICIOUS cookie truffles. To make, just skip step 2. Instead, roll your dough into balls, chill and then dunk in melted chocolate. 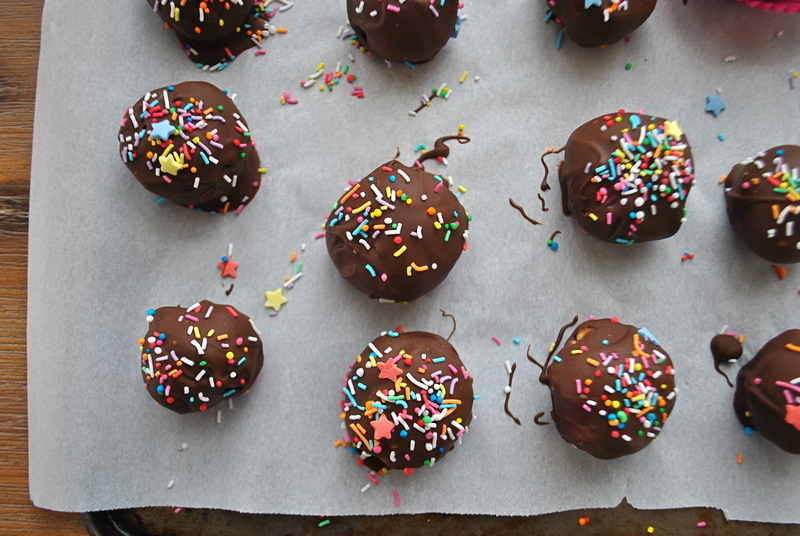 This is equally delicious and you can save yourself 10-15 minutes if you are UBER craving chocolate. Or you can just mix the dough and eat it straight out of the bowl. I’m not judging. This recipe is a huge cop out. Like, I don’t even know if it’s considered a recipe. But here we go. As I mentioned last week, I’ve been in a HUGE food funk. These overnight oats are what I have for breakfast, followed by some sort of toast with hummus for lunch and leftovers for dinner. I’m just not feeling food. It’s too hot here! Add to that the fact that the kids are now on summer break so I no longer have all afternoon to myself and there goes my cooking time! 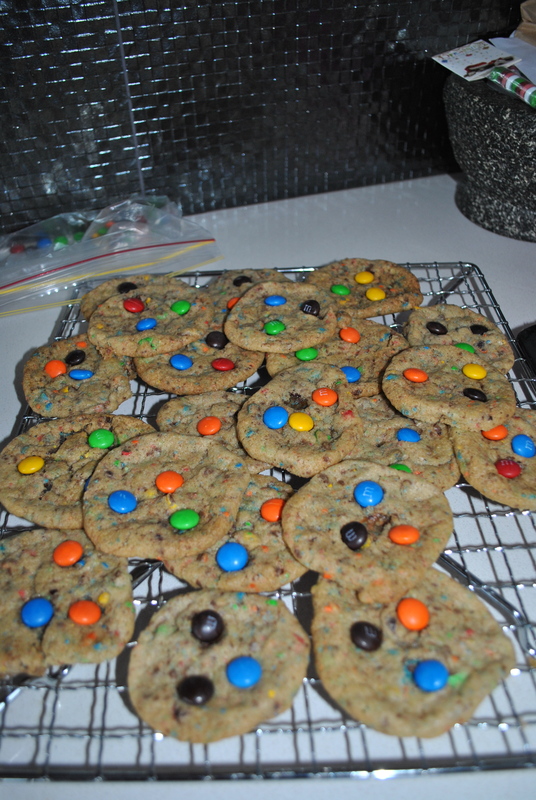 I did try to make some M&M cookies last week with the kids. The M&Ms weren’t vegan but I had leftovers from when I was making cookies for the kids’ teachers. The results were these colorful, flat-as-crepes cookies. Yeah…one of the kids put 1 1/2 c. of flour in instead of 2 1/2 c. of flour. Whoops. So basically, my cooking time slot has been narrowed down to the 30 minute reading time I force upon the kids each day. Well, it’s supposed to be 30 minutes but after taking out the 10 minutes I spend telling them to “focus” and “stop talking” and “stop making faces at each other” and “stop kicking each other!” and “Oh my gosh if I have to tell you one more time to read your book…!”, it’s usually only about 20 minutes. That’s why this recipe is perfect. 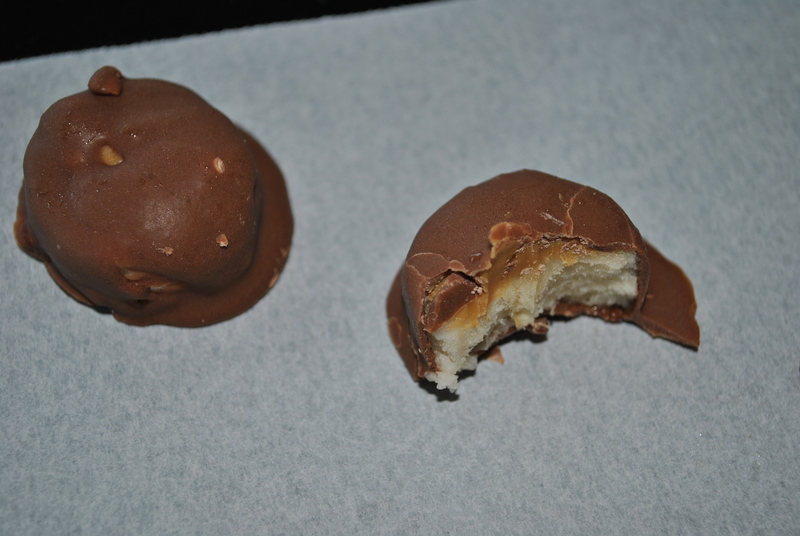 It takes about 10 minutes to prepare, you pop them in the freezer and the result is a little bite sized cold, chocolately/salty treat that you can grab in between activities. It’s hot here so they are perfect as an alternative to bites of ice cream. As for those in colder weather, they may be a healthier alternative to munching on holiday cookies? Either way, I thought these were a great little treat for myself but silly me, I made them in full view of all three kids. Which means I had to share. And they loved them. Which means they didn’t last nearly as long as I thought they would. I don’t know if that is a good thing because they were clearly tasty or a bad because now I have to use my precious 30 20 minutes of free time to make a much larger batch tomorrow. Line a baking sheet with wax or parchment paper and set aside. Cut your banana so you have round discs that are about 1/2″ thick. Top the discs with peanut butter. 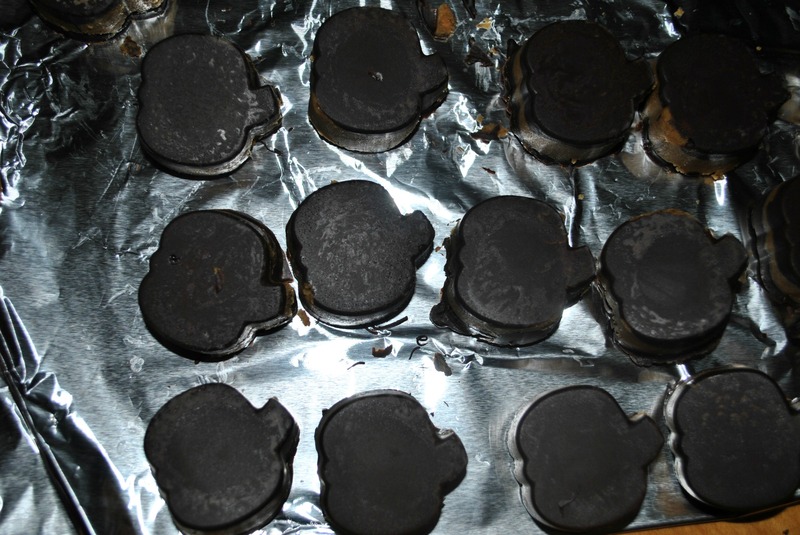 Melt your vegan chocolate in the microwave or on the stove with a double burner. I prefer the double burner method but whatever you find easiest. If your chocolate isn’t melting smoothly, add a little bit of shortening. Once your chocolate is melted, remove from heat. Dunk your banana into the chocolate. I found the easiest way to be with a fork. Pierce the side of the banana with the fork, then dunk it into chocolate. 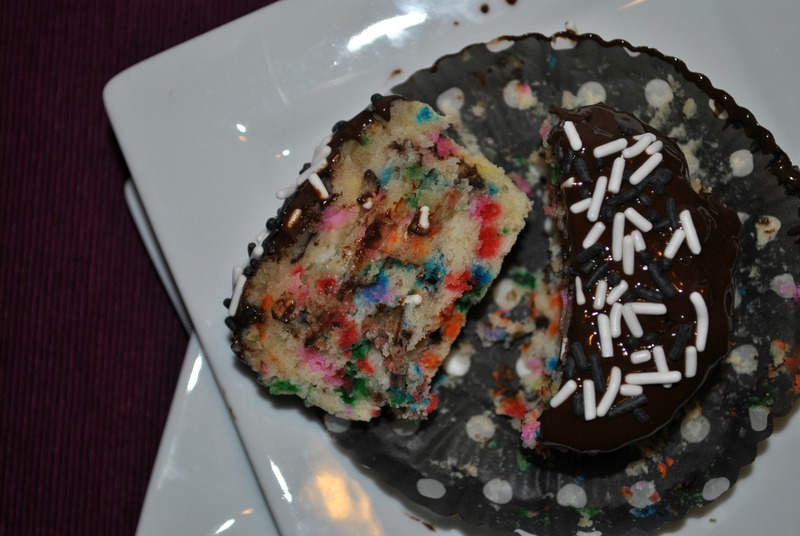 Use another fork to slide the chocolate-covered banana off the first fork and onto the wax paper. Freeze until the chocolate hardens. Remove from wax paper and place in a baggy or container and return to the freezer. I feel like the directions for this are really wordy. It could also read “Cut banana. Put PB on top. Dunk in Chocolate. Freeze.” 3 ingredients, 10 word instructions, and we’re done! Now if you’ll excuse me, I need to go secretly make another batch of these and hide them where the kids can’t find them. Why can’t they just be satisfied with messed up, flat M&M cookies? Sheesh! During the whole Team Lean Challenge I did with my friend, Rachel, I cut out a ton of bad food. I realized if it was in my house, I would eat it. I’m looking at you bread, pb and chocolate chips. I may not have cookies in the house but combined, you make an amazing 9pm snack. At the top of my list was pasta. It’s just so easy! I mean, I could roast a ton of veggies which takes forever… or I could just heat up some noodles and dump some sauce on it/cook up roman noodles/pour boxed mac and cheese into a pot. See. Pasta had to go. But the week of the bombings in Boston, a friend of mine was planning a potluck for Sunday as a way to end what had been a very stressful week on a positive note. It was a great idea! I brought this and all the non-vegans ate it up. I had no leftovers! Of course, it was so delicious, I was dying to make it again, fitness challenge or not! 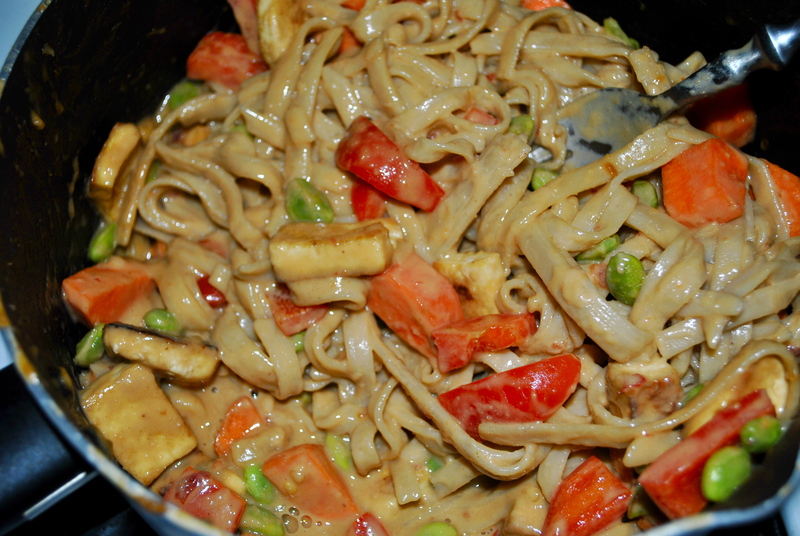 When I made it for just me, I pumped up the veggies significantly and added some tofu for an extra kick of protein. 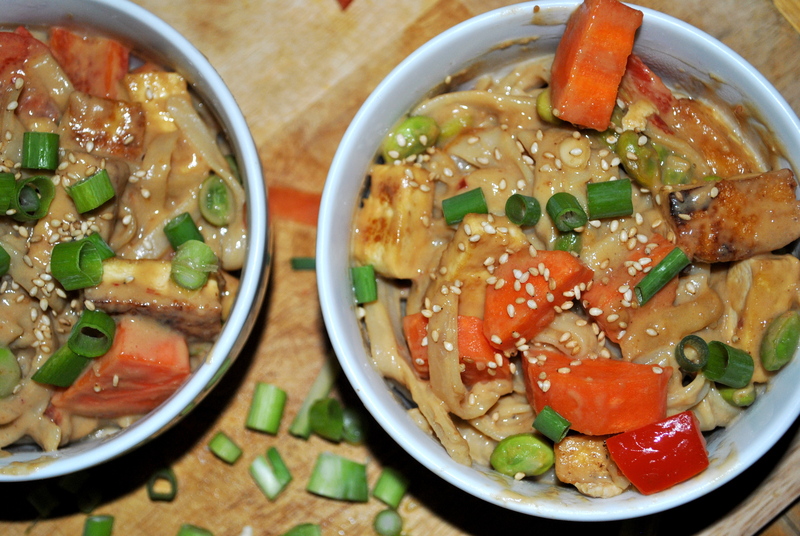 The result was a super creamy, veggy-packed noodle fest. So delicious! Bring a large pot of heavily salted water to a boil. Add brown rice noodles and cook according to package directions. Drain, rinse with cold water, and drain again. Return noodles to pot. Heat some sesame oil in a skillet. Saute tofu in the pan until golden. (if you prefer your veggies cooked, you can also throw them in with the tofu at this time. 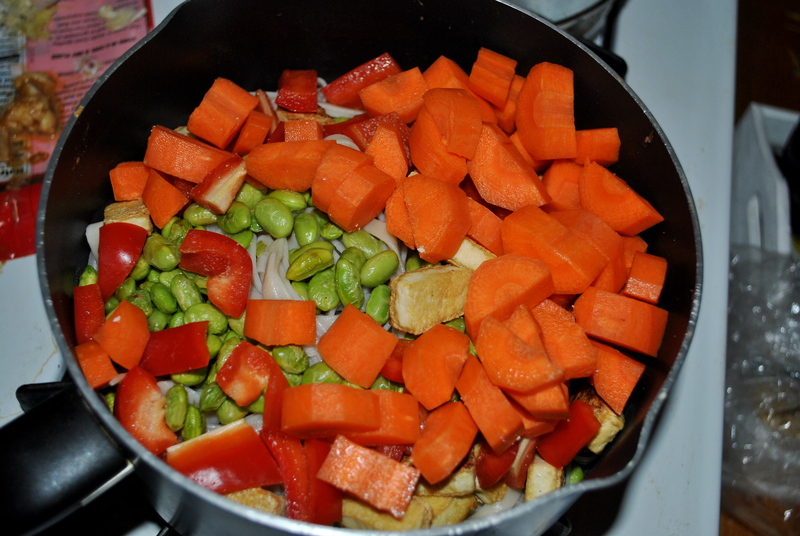 I sauteed my edamame with the tofu but left my peppers and carrots raw). Set aside. Meanwhile, make the sauce by combining coconut milk, water, maple syrup, soy sauce, peanut butter, chili-garlic sauce, ginger, and garlic in a medium saucepan. (this will look so gross when it’s all going into the pan and you will definitely be thinking “eeew! this is going to taste weird.” It won’t. Trust me.) Let cook over medium heat, whisking frequently, until sauce comes together and thickens. Remove from heat and mix in lime juice and sesame oil. 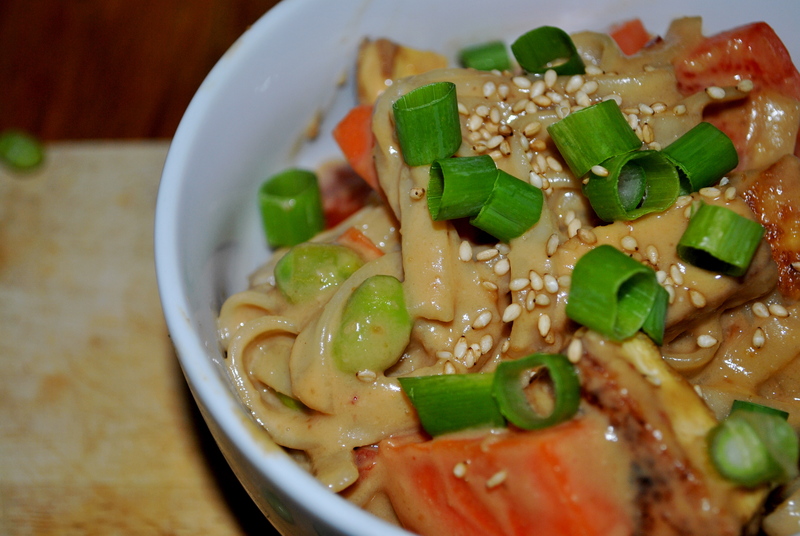 Toss hot noodles with the sauce, tofu and veggies. Garnish with peanuts and scallions and serve. Any leftovers can be served warm or cold the next day for a delicious lunch. I had fro-yo three times last week and may or may not be planning to share some Game of Thrones-themed cupcakes with you later in the week. Yeeeah…clearly, the fitness thing is over. Good thing I haven’t given up on the exercise! 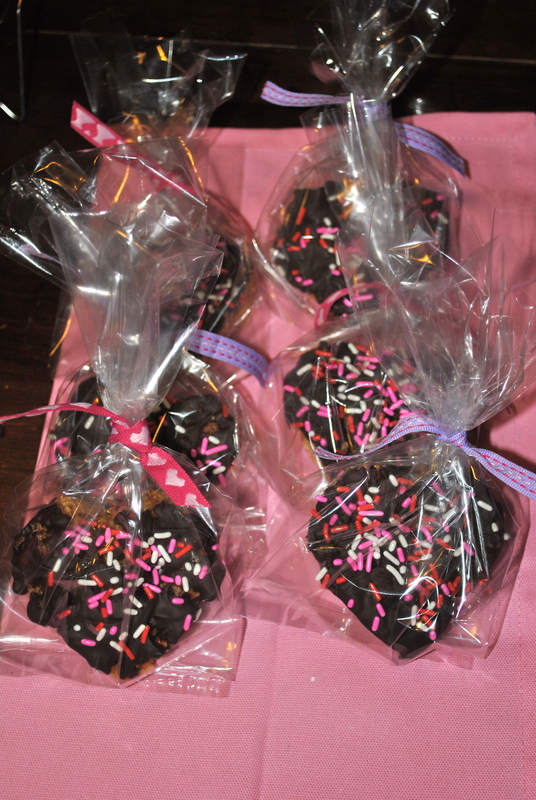 All I want to do all day is make Valentine’s Day treats!! Unfortunately, for my Valentine’s day- loving, Martha Stewart-wannabe side, I have that little thing called work that fills up most of my life. So instead of staying home all day and laboring over cute cupcakes with pink hearts inside, or red velvet heart-shaped pancakes, I have to find fast easy dessert that I can do in between work and my life. 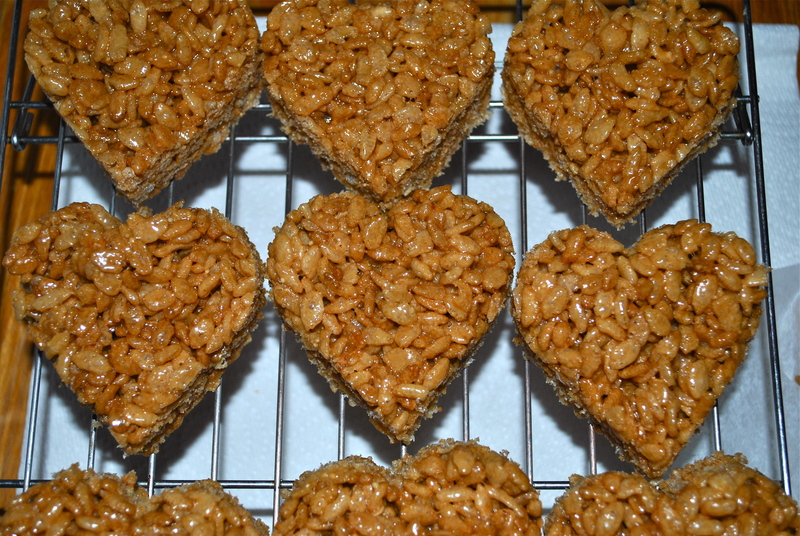 Enter heart-shaped Rice Krispie hearts. 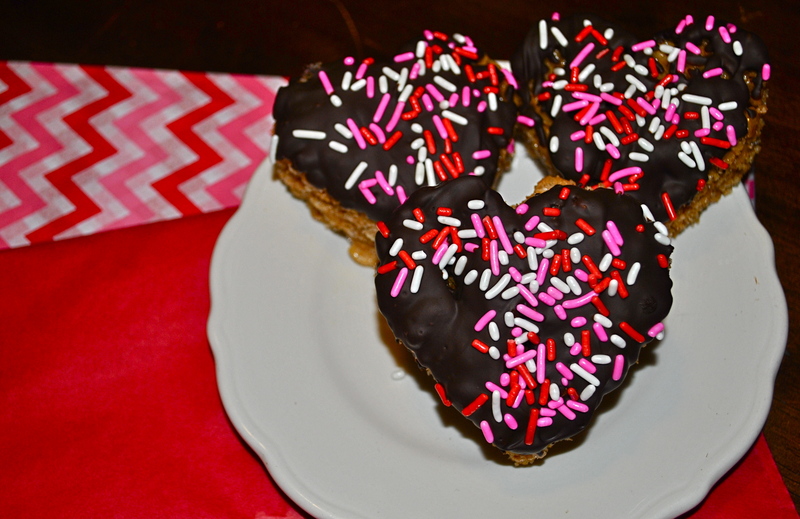 Cute, easy and able to decorate with valentine’s day sprinkles. yes, please! Heat rice syrup with a pinch of salt in a saucepan over low heat. When rice syrup liquefies, add peanut butter and stir until well combined and heated through. Pour entire box of cereal into a large bowl. Pour rice syrup mixture on top. Use your hands to incorporate everything together. 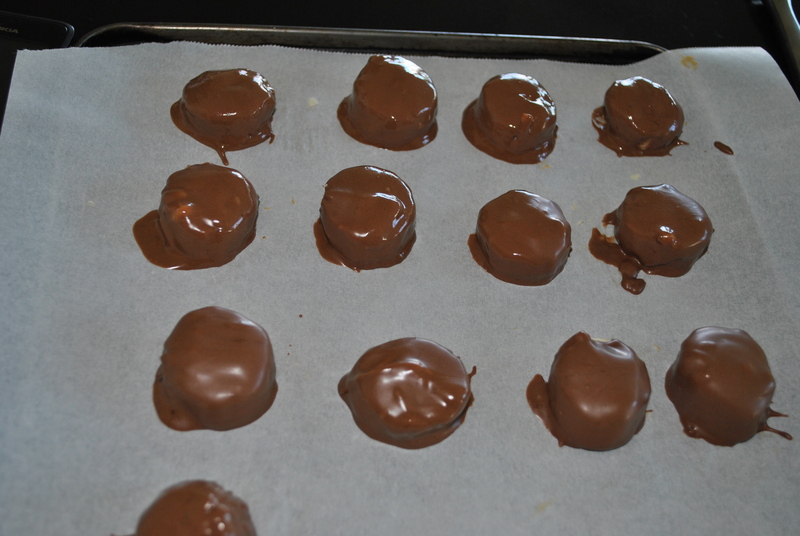 Melt chocolate chips in the microwave or on the stove using a double boiler (I prefer the stove-top method). Once melted, pull off heat and let cool for a minute or so. 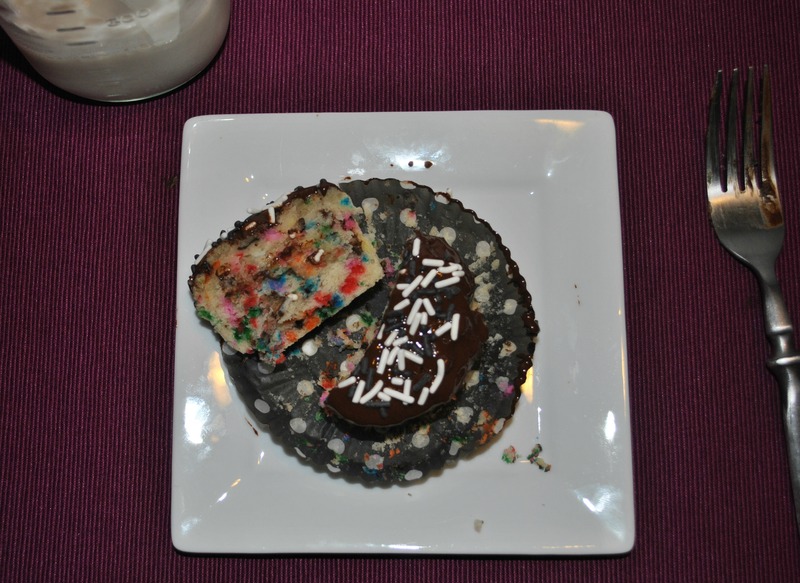 Dunk the top half of your rice krispies in the chocolate. Top with sprinkles. Let cool for 30 minutes to an hour. I apologize that I’m getting this recipe to you so late. I started it last night and then got distracted by the President’s speech (aka, fell asleep about 10 minutes in). BUT on the plus side, there’s only 5 ingredients and it’s super easy to make. You have PLENTY of time to pull this off before Valentine’s Day tomorrow. It would be such a cute surprise in that special someone’s lunch. Or your own! 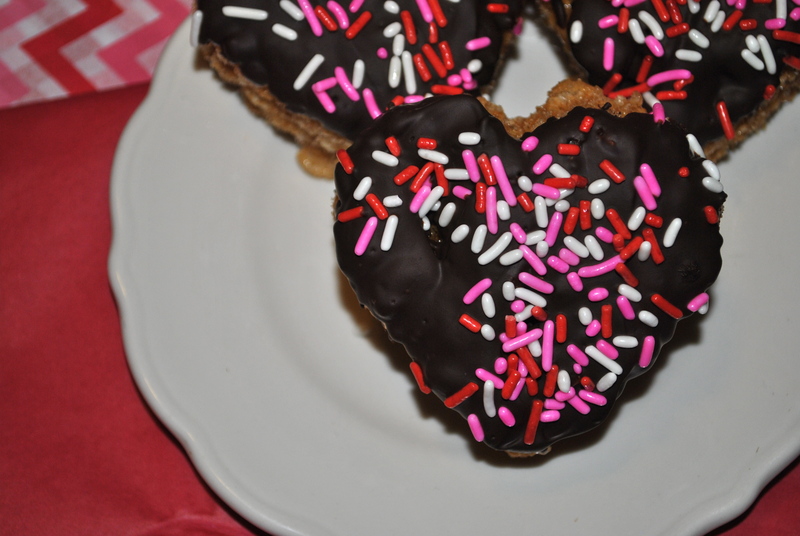 Tomorrow morning I will be posting one more Vday recipe (if it comes out), which is so ridiculous since you won’t have time to make it but I don’t care. I’m excited for it and who knows. Maybe you’ll have time to make it after dinner or you’re celebrating Valentine’s Day this weekend. Last Saturday I went to Target with the sole purpose of buying 1. toothpaste and 2. halloween-themed tupperware. Does anyone ever leave Target with only what was on their shopping list? If so, please tell me your secret. My wallet would kiss the ground you walk on. Anyway, in order to find Halloween tupperware, I had to walk into the Halloween section of Target. This was a problem. I. Wanted. Everything. I haven’t bought anything for Halloween yet because I haven’t had a chance to go through the halloween decorations I do have to see what I need. Plus, I didn’t budget for Halloween shopping! BUT I was convinced that if I waited until Friday aka Payday, everything would be gone. So there I stood, in the middle of the Target’s Halloween section completely paralyzed and teetering on the edge of a panic attack. I couldn’t stay and buy anything but I couldn’t go and leave all the pretty Halloween stuff behind! Thankfully, a very cute, bearded sales associate, seeing my wide, panic-strictened eyes, came over to me and asked me if I needed help. When I squeaked out Halloween tupperware, he told me they didn’t have any but he led me out of the decoration section…right into the halloween baking section. Dude, seriously? You just told me you didn’t have what I wanted, thus freeing up money I budgeted elsewhere, and then you proceed to lead me to my most favoritest section ever? Hence, the numerous halloween themed things from the Monday Things post. SO many cute sprinkles (traditional sprinkles or shapes? )…and liners (monsters or pumpkins? )…and spatulas (how can I choose between a big and a small spatula??). BUT I did manage to resist the urge to buy Reeses peanut butter cup pumpkins. Target- 50, Erin- 1. 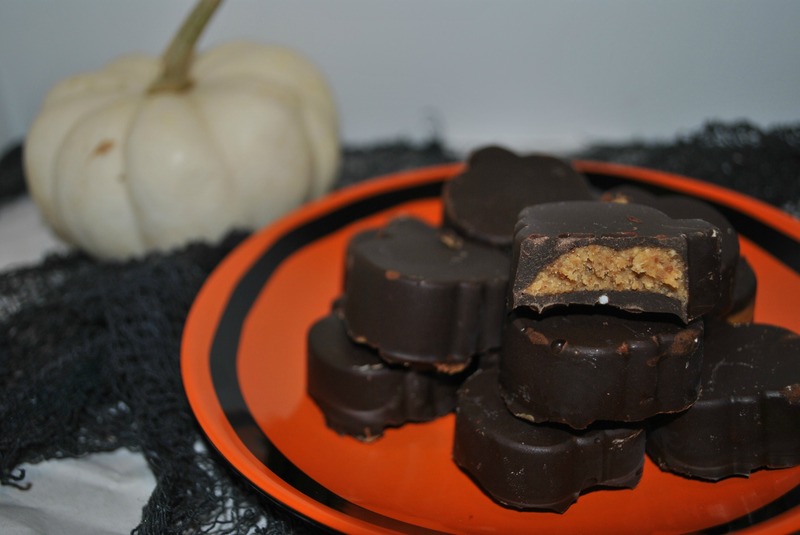 So what’s a girl with a Reese’s peanut butter craving to do? Melt half the bag of chocolate chips with a little bit of vegan shortening. Spoon the mixture into the candy molds. You want just enough to cover the bottom of the molds and to line the sides. (I just used a spoon for this. I found it to be the easiest way. I tried measuring spoons to be more precise and a butter knife but the spoon won me over.) 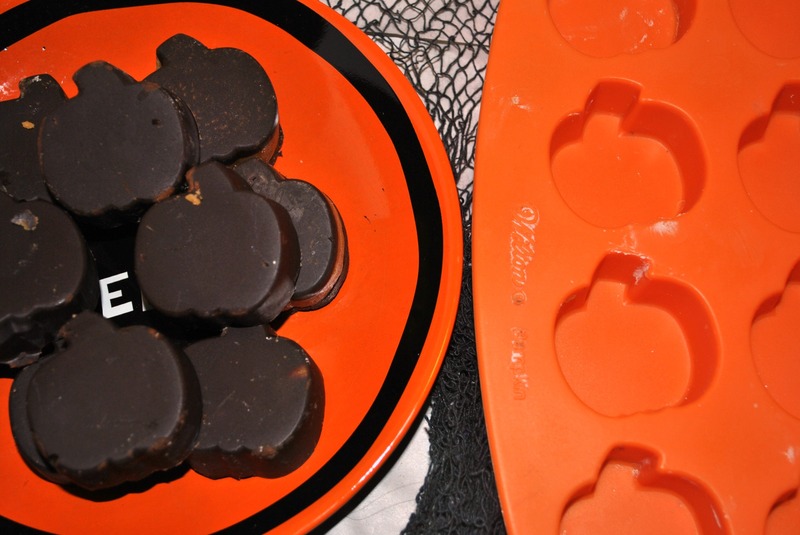 Once all the molds have chocolate on the bottoms and sides, place in freezer. Let sit for about 20-30 minutes to solidify. Once the chocolate is solid, melt the butter in a small saucepan over medium heat. Stir in the peanut butter, graham cracker crumbs, and sugar and mix well. Remove the mixture from the heat. Spoon the mixture into the candy molds. Fill almost to the top but leave a little room for the top chocolate layer. Place in the freezer to solidify, again, about 20 minutes. 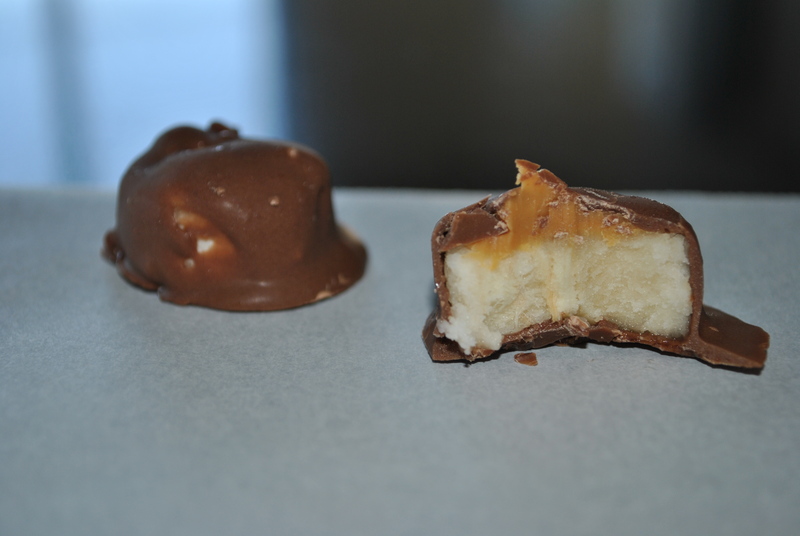 Once the peanut mixture is hard, melt the rest of the chocolate with a tiny bit more shortening, and fill the rest of the molds with chocolate. 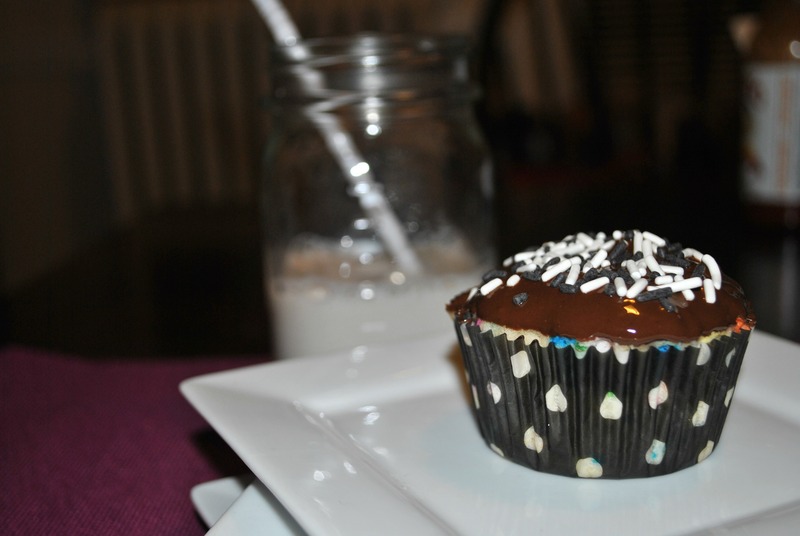 Stick in the fridge for at least 2 hours for the chocolate to harden and the rest of the cup to not be so frozen solid. This recipe made about 36 pumpkins. Since I only had 1 tray of molds, I just left the extra chocolate and peanut mixtures in their pots and reheated them when it was time for round two. I didn’t have any problems with this. I’m 100% in love with this recipe. They are cute. They are delicious. They are shaped like pumpkins! And they should help with those candy cravings when all those kids are ringing your doorbell halloween night. You can be all like “sure, here, have a chemically ridden, refined sugar-filled, made-in a factory candy bar. 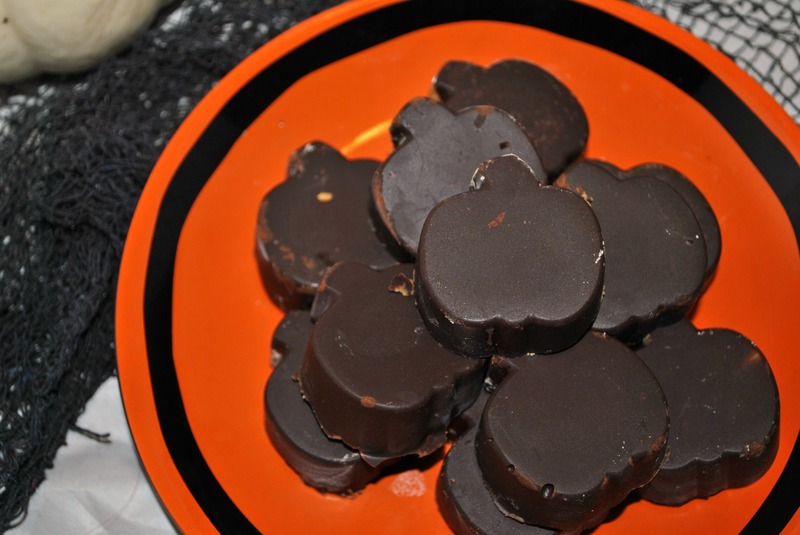 I have homemade peanut butter pumpkins! ‘ So there! Guess what I discovered this week? Spotify’s radio station “The Best Emo Songs of All Time”. I’m absolutely dying right now! I was all about the emo music in high school. I used to listen to Dashboard Confession and Brand New ad nauseam. This was pre-Ipod days, though. I remember sitting on the bus (ugh, if I never have to ride another bus, I’ll die happy) with my CD player and I’d listen to whichever CD I had over and over again. I saw Get Up Kids, Ataris and MXPX live in concert and I’m pretty sure my life was complete when MXPX played GSF live. Ok…maybe I still have a rather large soft spot in my heart for emo music (and Chris Carrabba…) I clearly need to get an Iphone just so I can carry this radio station with me everywhere! Know what else I discovered this week that has nothing to do with my questionable taste in music (I actually made a Spotify playlist with Drake, Justin Bieber and Taylor Swift…who am I?)? That this is Wicked Vegan’s 100th post!! YEAH! I was going to post a quesadilla for this post but I realized, um…a quesadilla isn’t celebratory at all. I need some sprinkles up in this joint! 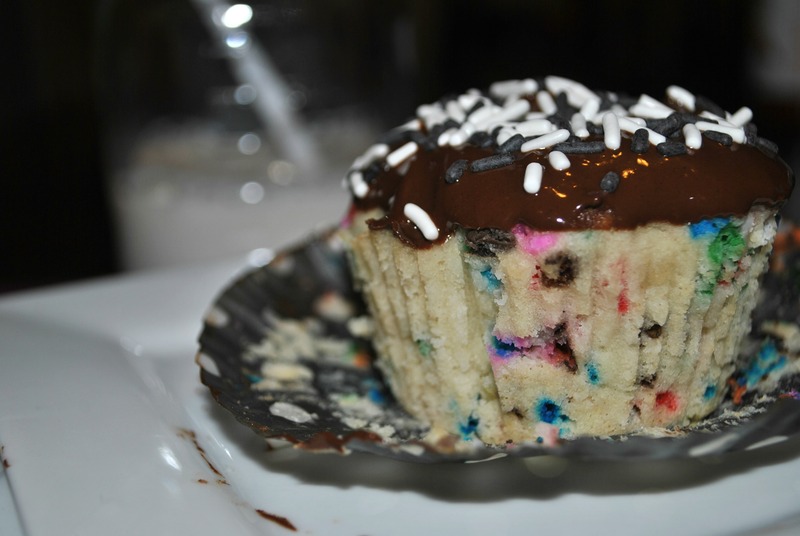 Enter, the single-serving funfetti cupcake. Directions: Preheat the oven to 350 degrees. Mix the ingredients and pour into an oiled (or sprayed) muffin pan. Smooth top of batter. Cook for 12-15ish minutes. For the “frosting”, I was out of Earth Balance so a traditional butter cream was out. Plus, I wanted something fast to go with the recipe. So I just melted about an 1/8th cup of chocolate chips with a tsp of peanut butter in the microwave then swirled my cupcake in it. YUM! You should be warned that Wicked Vegan’s 1 year birthday is coming up. As is, my birthday and the first day of fall. Expect a few more celebratory cupcakes! Best part of this post? As I was writing this, Spotify let me know I can post a playlist on a blog. It’s like they know me! So, here’s your playlist for your single cupcake adventures!